Your erstwhile host locks himself in his mining-camp bunker with a laptop, a wifi connection, a cup of tea in a paper cup, and cable TV flicking between Sky Election 1, Sky Election 2 and the Election 2013 channel (on Sky). Against this tense backdrop, he attempts to crack his fingers and, failing to elicit the desired sound, cracks his neck. 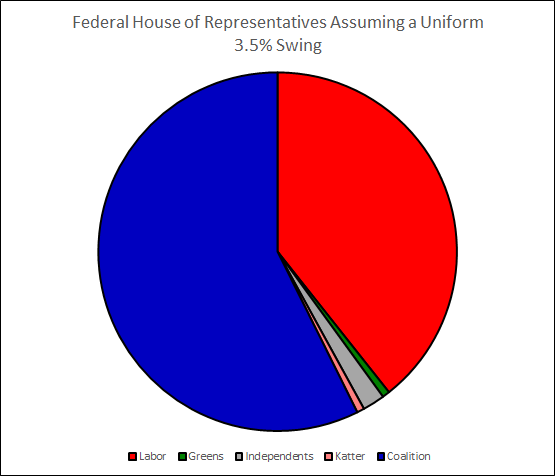 The 2010 election was (just) won by Labor with 50.12% of the 2PP vote (Wikipedia), which suggests a 3.5 percentage point swing to the Coalition. (Or a 7 pp total adjustment, which some people call a swing). Newspoll was giving the ALP a 50.2% 2PP vote before voting day 2010, which is a 3.2 pp swing to today's figures. Now for a little more of the nitty-gritty. Here I outlined 44 seats to watch, including O'Connor which we will return to later, but ignore here. Let's assume there is no pro-ALP swing tomorrow sufficient to deliver fresh seats to Labor. We can then strip away any of those 44 held by the Coalition. This leaves us with 23: Bass, Blair, Braddon, Canning, Chisholm, Corangamite, Deakin, Denison, Dobell, Eden-Monaro, Greenway, La Trobe, Lilley, Lindsay, Lingiari, McEwen, Moreton, Page, Parramatta, Perth, Petrie, Richmond and Robertson. Now take out those we have already passed over to the Coalition, and we have 12: Bass, Blair, Braddon, Chisholm, Denison, Dobell, Lingiari, McEwen, Page, Parramatta, Perth and Richmond. These require further analysis, along with Banks, Brand, Lyne, and Reid (which we have passed to the Coalition despite not being on the short list), and all the seats held by Independents, Katter and the Greens. Bass, Blair, Braddon, Chisholm, Dobell, Lingiari, McEwen, Page, Parramatta, Perth and Richmond are probably going to see larger swings than elsewhere. Some people are predicting a 6% swing, Blair, Chisholm, Dobell, Lingiari, Page, Parramatta and Perth would all fall under this swing, so I think there is a fair chance that most of these will cross the line. This is a big ask for Bass, Braddon, McEwen and Richmond which may still suffer those ever pressent, abberant super-swings. I am leaving McEwen with the ALP based on its margin, and putting Bass, Braddon and Richmond as tossups. Banks has been Labor since it was founded in 1949. There is no evidence in recent results to suggest a slow transition to the Coalition, and its current position may well be about as right-wing as the seat can go. Call this a tossup, I'm informally tipping the ALP to hold this seat so often touted as a certain Liberal win. Brand is 100% ALP at the state level, dispite the massive anti-Labor swing earlier this year, and has always been Labor. Counter to common opinion, I'm calling this an ALP hold. Reid has been Labor since it was founded in '22, and its current 2PP rating is the lowest for Labor in a long time. I feel this seat is as close to changing as it will go. Safe ALP. Melbourne is one of the Greens' best shots, and has been good for them for a while. Yes, the Greens hold this seat, but only just. If the seat's how to vote cards go as I expect, and factoring in the smashing the Greens are expecting, Melbourne will probably slide back to Labor. Then again, independently thinking Liberal voters may hate Labor enough that the Greens could get a little boost by out-polling the Libs. Then again again, even when winning the seat in 2010 the Greens could not outpoll the Liberal Party. In short, I'm giving Melbs back to the ALP, and leaving the Greens with no seats in the house of reps.
New England and Lyne have retiring Independents in strong Nationals seats. Two wins for the Coalition. Fisher is currently Independent, but he was elected as LNQ. Peter Slipper is a long-term incumbent, but the swing to the Coalition will probably work against him. Calling this a tossup, but guessing this is a Coalition win. Dobell, on the other hand, has an ex-ALP Independent who may pick up the Labor-disliking, left-leaning vote. Tossup. Denison has an Independent whose margin is against the ALP. 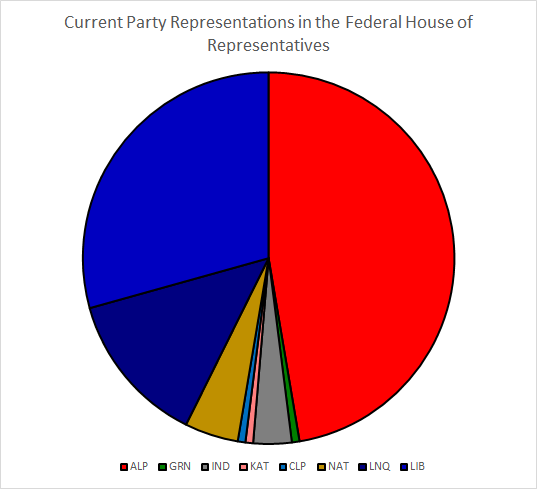 People looking to not vote for either major party will probably favour the status quo, along with anyone who prefers the major party that drops out first. This one stays Independent. Katter has held Kennedy forever. In an election where both the LNQ and ALP are struggling to appeal, in a seat where politician-hating is a common hobby, the Kat in the Hat will be back. Finally, I want to look at Fairfax which is Clive Palmer's best bet (and his own seat). 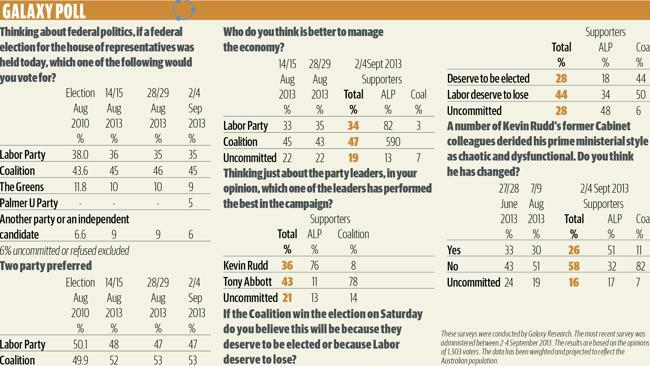 If the ALP drops out before Mr Palmer, he will get the bulk of their support and may win the seat. However the seat has been LIB/LNQ since 1990, Coalition since foundation in 1984, and a LNQ primary vote twice that of the ALP I don't see the Labor vote being large enough to bolster Palmer over the LNQ. (Nor do I see Palmer outpolling the ALP, but who knows?) Safe LNQ. 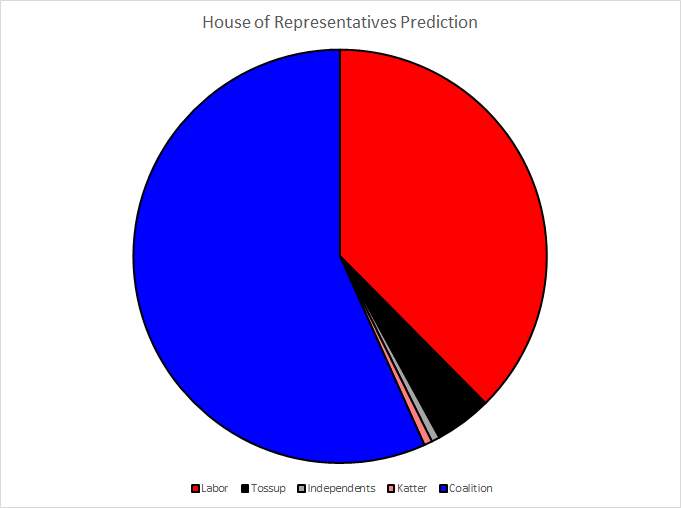 Another prediction of a clear Coalitin victory in the lower house. I get no points for that. I do get a possible 143 points for the seat-by seat predictions, though, so lets see what happens tomorrow. If I get the time before polls close in the eastern states, I'll try and get some Senate predictions online. Otherwise, see you after the vote! Correction: for some reason I did not include Eden-Monaro in the 12 (13) that should change to the Coalition in the second & third round of graphs. Predict Coalition win in EM.